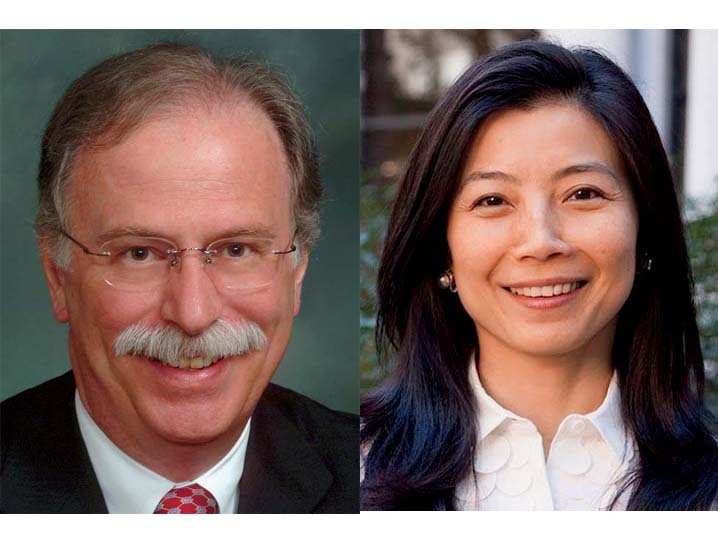 Scott A. Abell ’72, past president of the Harvard Alumni Association, has been elected president of the Board of Overseers for 2017-2018, and Tracy P. Palandjian ’93, M.B.A. ’97, will serve as vice chair of the executive committee. The service will conclude their six-year terms as Overseers. They succeed Kenji Yoshino ’91, and Nicole Parent Haughey ’93, respectively. The Faculty of Arts and Sciences has conferred five-year Harvard College Professorships—its highest honor for undergraduate teaching, advising, and mentoring—on Amanda Claybaugh, Zemurray Stone Radcliffe professor of English (see Harvard Portrait, May-June 2012, page 42)—a previous winner of the Graduate Student Council’s award for excellence in mentoring; Melissa Franklin, Mallinckrodt professor of physics (see “Learning by Doing,” May-June 2014, page 18); Gonzalo Giribet, professor of organismic and evolutionary biology; Marko Loncar, Lin professor of electrical engineering—a prior winner of the Undergraduate Council’s Levenson Memorial Teaching Prize; and Tommie Shelby, Titcomb professor of African and African American studies and of philosophy. David Cox, assistant professor of molecular and cellular biology and of computer science, and Lorgia García-Peña, assistant professor of Romance languages and literatures and of history and literature, were honored with the Abramson Award for outstanding undergraduate teaching and their sensitivity and accessibility to undergraduates. The Undergraduate Council’s Levenson Memorial Teaching Prize was conferred on Oliver Knill, preceptor in mathematics; Anna Klales, preceptor in physics; and Stephen Rosen, Kaneb professor of national security and military affairs. The council’s Marquand Prize for exceptional advising and counseling was conferred on Gregory Bruich, lecturer on economics; Avik Chatterjee, tutor in Currier House; and Gregg Peeples, Allston Burr assistant dean, Winthrop House. The Graduate Student Council’s Mendelsohn Excellence in Mentoring Award was conferred on García-Peña (making her a two-time honorand); Barbara Grosz, Higgins professor of natural sciences; Jerry Mitrovica, Baird professor of science (featured in “The Plastic Earth,” September-October 2016, page 46); Ahmed Ragab, Watson associate professor of science and religion; and Xiaofei Tian, professor of Chinese literature. Finally, Elena Kramer, Bussey professor of organismic and evolutionary biology (she is also department chair and a Harvard College Professor), and Martin Nowak, professor of mathematics and of biology, received the Cox Prize for Excellence in Science Teaching (which is accompanied by a $10,000 personal award and $40,000 in support for teaching and research). Faculty members newly elected to the National Academy of Sciences include David Charbonneau, professor of astronomy (see Harvard Portrait, March-April 2008, page 57); Noam D. Elkies, professor of mathematics; David D. Ginty, Lefler professor of neurobiology; Barbara B. Kahn, Minot professor of medicine; Ariel Pakes, Thomas professor of economics; Madhu Sudan, McKay professor of computer science; Rachel I. Wilson, Martin Family professor of basic research in the field of neurobiology; and Junying Yuan, Hay professor of cell biology. Winners of Pulitzer Prizes this year include David Fahrenthold ’00, of The Washington Post, for his coverage of the presidential election campaign; novelist Colson Whitehead ’91, for The Underground Railroad (read a full profile, “A Literary Chameleon,” from the September-October 2016 issue, page 32); Loeb associate professor of the social sciences Matthew Desmond, in nonfiction, for Evicted: Poverty and Profit in the American City (profiled in “Disrupted Lives,” January-February 2014, page 38); composer Du Yun, Ph.D. ’06, for Angel’s Bone; and, for their part in teams recognized for collaborative work, David Sanger ’82, of The New York Times, in international reporting for work on Vladimir Putin’s projection of Russian power abroad, and Peter Newbatt Smith ’83 and Richard P. Sia ’75, staff members of the International Consortium of Investigative Journalists, recognized for explanatory reporting on the Panama Papers. Details and links are available at harvardmagazine.com/pulitzers-17.